Justin Chinchen, shown at right in photo above sampling sauce with his brother Josh, creates complex barbecue sauces that partner well with Callicrate meats, including brisket, pork ribs or even baked Alaskan salmon. THE BACKSTORY: Before moving to Golden, Colo., Justin worked on a horse ranch in California, and once a week, for extra rent money, he’d cook dinner for the ranch owners. On the day he made whiskey tart cherry ribs, he heard the words that have launched many an artisan food business: “You should bottle this stuff.” The resulting whiskey sweet cherry sauce became the original sauce in his line-up. 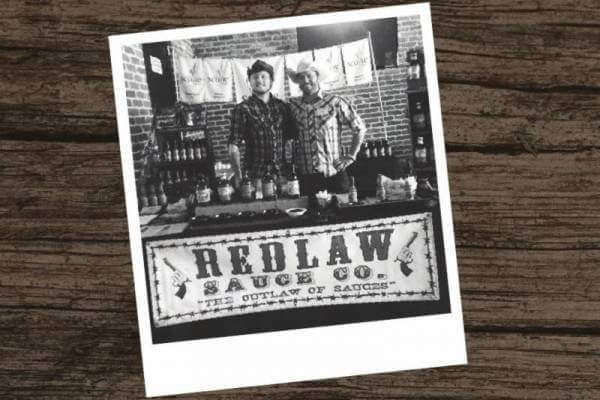 When Stan Walder, the owner of the ranch, later died unexpectedly of a massive aneurysm, Justin sought permission from his wife to name his own company Redlaw in honor of the Redlaw Ranch where the story of the sauce first began. THE SAUCES: Ranch Foods Direct carries Justin’s whiskey sweet cherry and blueberry pomegranate Redlaw barbecue sauces. Of the whiskey sweet cherry, Justin says, “There’s a very special technique to it. There’s a shot of bourbon in every bottle.” The mixture includes ingredients like caramelized onions and garlic and mustard seeds that are carefully cooked down over a long period of time to create dense, rich flavors. While the popular option is to glaze meats on the barbecue grill, Justin prefers to serve the sauces on the side for dipping: “I’ll make a nice steak, with salt and pepper, and then dip the steak in it.” Justin also uses them on salmon: “After searing the salmon filet in a pan, I’ll put a little layer of barbecue sauce on it and finish it in the oven,” he says. Ranch Foods Direct has sampled it on St. Louis-style pork short ribs, with outstanding results. WHAT’S NEXT: Justin has started providing co-packing services to other artisan food businesses, much the way Ranch Foods Direct provides packaging and labeling for small ranchers who want to get their own products out into the marketplace. Justin also provides commercial canning services for small organic farms in Colorado. Pick up some Redlaw barbecue sauce when you shop the store and check out the savings on a wide assortment of Callicrate beef and pork bundles! Buy in bulk and save.